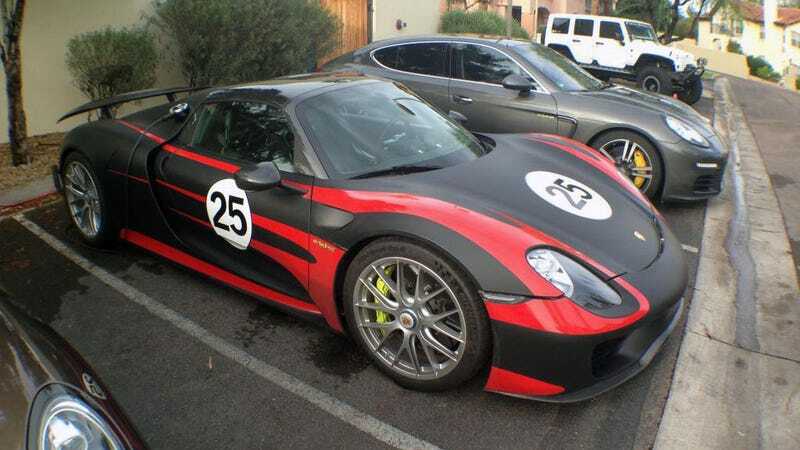 The white Porsche 918 Spyder is not bad, but what you really want is the red and black foil-wrapped Weissach package car with magnesium wheels and other weight-saving magic. Find them in Arizona. Porsche took two 918 Spyder prototypes, the 911 Turbo S, the Cayman S and the Panamera Hybrid to Northern Arizona for some hot weather and altitude testing. The black and red one is the 918 which Chris Harris had the fortune to drive, and the one we all really want. I just can't get enough of those exhaust pipes coming off the 918's V8. Good hunting out there, Arizona! Hat tip and image credit to Brian McCauley!